Jean-Baptiste Bessières, duke of Istrie (1804). Bessières takes part in all the campaigns. When he dies on the battle field, Napoleon written to his widow: " the loss that you make and that of your children is undoubtedly large, but mine is more still. The duke of Istrie died of most beautiful death and without suffering. He leaves a reputation without spot, it is the most beautiful heritage which he could bequeath to his children. Without the Revolution, Bessières had certainly been a doctor like his father. When it occurs, it engages in the Guard national and joined the constitutional Guard of the King in April 1792. Later, its body, the 2è hunters, joint with the Army of Italy. Promoted head of the body of the guides by Bonaparte, it is illustrated with the battle of Rivoli (January 14, 1797). At the time of the campaign of Egypt, it is distinguished with the seat from Saint-Jean d' Acre (March 19 at May 20, 1799) and with the battle from Aboukir (July 25, 1799). become one of familiar of Bonaparte, it form part of those which it accompany in France and take share with coup d'etat d' Etat of 18-Brumaire. 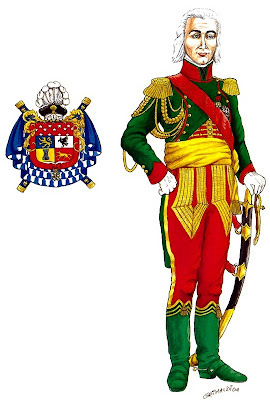 In reward, it is named second in command of the consular guard, the future imperial Guard.June 14, 1800 in Marengo, its control at the time of the load of the cavalry saves to him the rank of brigadier general. Two years later, it became major general (September 13, 1802). When comes the Empire, in 1804, it is on the list of the marshals, accuracy: its name is the last. When the campaign of Austria begins the following year, Bessières controls the Guard. In Austerlitz (December 2, 1805), its cavalry collapses the Russian imperial Guard. It is the beginning of the reputation of invincibility of this famous body.Bessières is present at Iéna (October 14, 1806) and at Eylau, February 8, 1807, where its cavalry and that of Murat manage to stop the Russian attack at one critical time. In Poland, it carries out the reserve of cavalry lately formée.En 1808, Bessières is sent in Spain to direct the army corps which occupies Salamanque. It goes to the meeting of the Cuesta General, who threatens to cut his communications with France. A 14 000 men against 40.000, it gains the victory with Medina LED Rio Seco (July 14, 1808). By learning it, Napoleon exclaims: «Bessières put my brother on the throne of Spain». The following year, Bessières is named duke of Istrie and again controlling cavalry of the Guard for the campaign against Austria of 1809. In Wagram, a ball kills its horse and makes him lose consciousness. The Guard, which adores it and believes it dead, is afflicted. Napoleon says to him: «Bessières, here is a beautiful ball! It made cry my Guard». In 1811, governor in Spain, it makes watch of a great probity and great cares for the civil populations. The following year, it takes again service, always with the head of the Guard, for the campaign of Russia. In October, it draws the Emperor from a critical situation; 6 000 cossacks melt suddenly on the headquarters, in the village of Shorodina. Bessières runs with his men and pushes back the attack. For the campaign of Saxony of 1813, it receives the command of all the cavalry. With the battle day before of Lützen, May 1, 1813, it is in recognition when a ball of gun reaches it in full chest. Its body rests with the Invalids. Jean Baptiste Bessières, Duke of Istria, he wears the green "surtout", as commander of the legendary Chasseurs de la Garde à cheval. Honest, faithful and courageous, one of the preferred By Napoleon. One of the few Marshals to die in battle (as Lannes and Poniatowski) Five gold chevrons on the breeches to represent the rank of Colonel of Chasseurs.